There are lots of bottles of beer, whiskey, and other instruments of intoxication already scattered throughout the rolling hills of Fallout 76’s West Virginia, but on March 12 players will be able to start making their own. Today’s Inside the Vault article sheds light on how the whole thing will work. 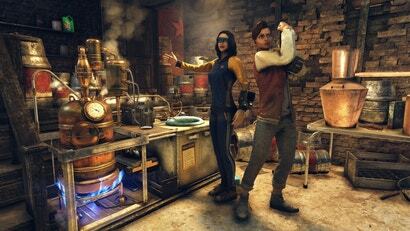 The update, originally teased last week, will introduce Biv, a bartending robot who resides on the fringes of Vault-Tec University’s Scorch-infested campus. 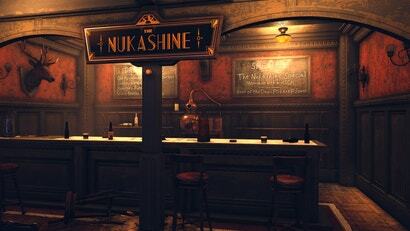 There you’ll be able to chat him up and gain access to a new quest called Wasted on Nukashine. Completing it will give players access to the blueprint to construct a brew station workbench at their campsite and proceed to never again shut up about their favourite kind of bitters. Fresh Effects: Increased scope stability and damage versus animals, but reduced VATS accuracy. Effect: Your successful melee attacks have a chance to inflict you with a disease but may also refill your hunger meter. Fresh Effect: Your melee attacks will result in self-immolation, damaging both you and your attackers. Vintage Effect: In addition to its fresh effects, Firecracker Whiskey will set enemies on fire from your ballistic and melee attacks. You’ll need the recipes to create these and other drinks, which can be obtained by completing the daily quests handed out by Biv. Why bother trying to rebuild society when you can just cook up some authentic Appalachian hooch instead? If I was forced to live in Fallout 76, I’d spend most of my time getting blitzed too. Fallout 76 has fallen into the trap of a lot of online games and that's under estimating how fast players will go through content. You have a few die hard's still playing but most people even if they liked it have finished everything and already moved onto greener pastures. "If I was forced to live in Fallout 76, I’d spend most of my time getting blitzed too." Bethesda, stop trying to make Fallout 76 happen, it's not going to happen! If this is what they're focusing their efforts on, then the question about why FO76 is such a hot-mess is pretty much self-explanatory.